For a natural and healthy tan! 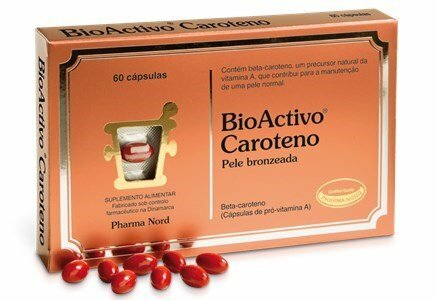 The Bioactive Carotene dietary supplement contains nine milligrams of pure, highly absorbable beta-carotene. Beta carotene is the natural precursor of vitamin A (retinol), being partially converted into vitamin A in the body. It is also a powerful antioxidant that neutralizes harmful free radicals, thus increasing the body's natural defenses against diseases. In addition to precursor of vitamin A (retinol), beta carotene has independent functions as a powerful antioxidant, which may become useful under certain conditions when there is plenty of free radicals. Exposure to the Sun, for example, produces free radicals that cause definitive injuries if not neutralized. Take 1 capsule per day, during the meal, with water. Converting beta-carotene into retinol (vitamin A classic term) takes place in the intestinal mucous. Vitamin A is fat-soluble, having the risk of being taken in overdose. Beta carotene (also called provitamin A) is water soluble and therefore completely safe even in high amounts; This is because, among other reasons, the body only converts beta carotene as in need of retinol. If there is sufficient amount of retinol in the body, is immediately triggered an automatic locking function, preventing the conversion proceed. This safety precaution prevents the toxicity. A sunscreen for every skin type! Whatever your skin type, there is an appropriate sunscreen to your needs and preferences! Vitamins and minerals are a vital part of a healthy diet. Know everything about this, with Sweetcare.